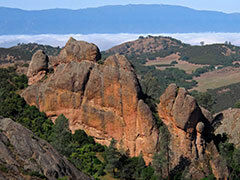 This place was formerly known as Pinnacles National Monument; now it's Pinnacles National Park. But according to Wikipedia, "the change in designation does not change the park's status, management, or purpose." Okay then. Here's a map of the hike.